B vitamins are essential components in most major metabolic reactions. They play an important role in kidney function. This fat-soluble form of vitamin B1 has higher bio availability compared to water-soluble forms. 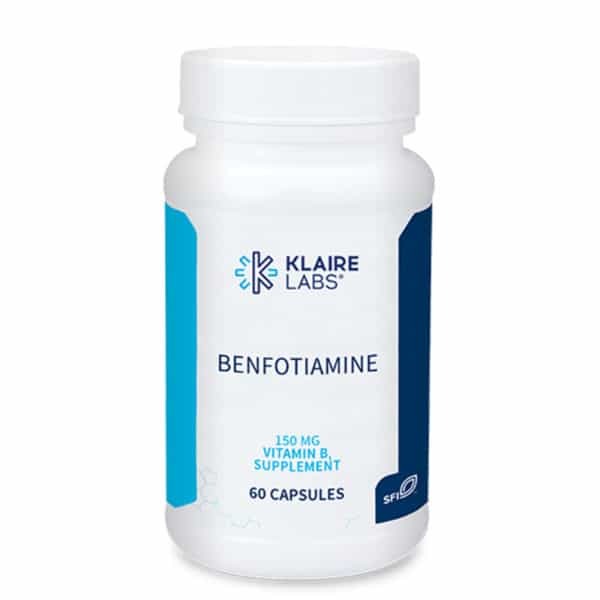 Benfotiamine inhibits several pathways involved in glucose-induced vascular changes and supports healthy neuron function.† Clinical studies show that benfotiamine supports healthy neurological structures and glucose metabolism, limiting the formation of advanced glycation end products (AGEs).† Benfotiamine may also be a preferred choice after bariatric surgery as thiamine deficiency is frequently found in these people due to malabsorption. As co-enzymes, the B vitamins are essential components in most major metabolic reactions. They play an important role in kidney function, energy production, including the metabolism of lipids, carbohydrates, and proteins. B vitamins are also important for blood cells, hormones, and nervous system function. As water-soluble substances, B vitamins are not generally stored in the body in any appreciable amounts (with the exception of vitamin B-12). Therefore, the body needs an adequate supply of B vitamins on a daily basis. Suggested Use: 1 capsules daily with food or as directed by a healthcare professional.